Actually your analogies to Fresh Dried Hops and Fresh Dried Foods are not entirely accurate. I agree that fresh dried vegetables or herbs doesn't sound as nice as the fresh harvested but there is something you're failing to understand and that is the compounds in hops and their extraction when wet, when dried, and after a period of storage. First think of hops more like marijuana. You wouldn't/couldn't smoke marijuana when wet. Marijuana is the best to compare given their similarities and properties. First off the cannabinoids need to evaporate the water molecules attached to them in order to achieve the desired level of potency, aroma, flavor etc.. also the nitrogen content in the leaves needs to break down so there is not the harsh flavors. Hops are exactly the same. As a brewer the grassy flavors are not always wanted. 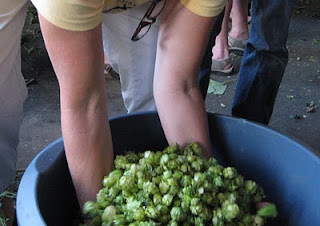 So freshly dried hops has the most "potency" to them given the aroma and flavors desired. They have a bit less nitrogen content which would mask those great flavors you want out of the hops. Brewers who use whole leaf hops make the best beers after harvest and within the first 3-4 months. The best aroma compounds are at their height during this time. So the brewers using freshly dried hops are trying to give the cleanest flavor from the hops and not mask the aromas with grassy and plant like aromas. Also remember the marketing behind these beers, you'd be surprised if you could find out what percentage of hops are wet and which are pellets... most are using pellets somewhere in the process to balance the the plant like wet hop characteristics. Nice work Bill, way to keep on top of the fresh hop cheaters. Chad: I appreciate what you're saying, but people have come to expect that "fresh hop" means "hasn't been dried" -- just like fresh lettuce, fresh basil, and so on. Yes, fresh hops contribute a grassy flavor, but that's the whole point! A little vegetal flavor is expected and even appreciated. Like you said, most of these are going to have some amount of dried hops or even pellets in them, and that's to be expected. What ticks me off is when a "fresh hop" beer is 100% dried hops. The analogy with pot is way off -- maybe you can't smoke pot that hasn't been dried, but you can toss fresh hops into a brew at any point. Nice post and interesting topic. I enjoy the fresh hop beers from Great Divide and Sierra Nevada. I can't get many of the others in South Dakota. A new local offering I'm looking forward to is Brau Brother's Hundred Yard Dash. They are about an hour east of me.